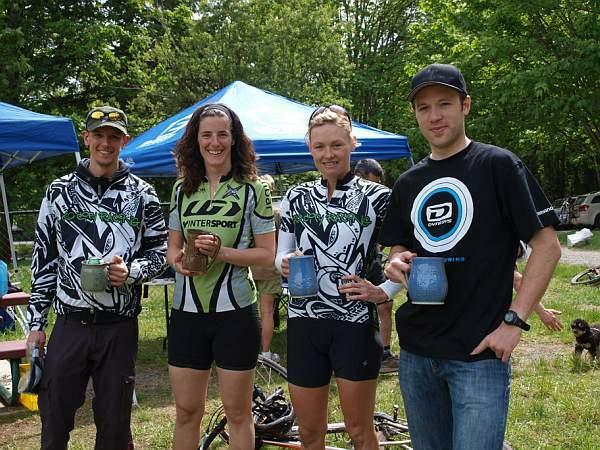 First, I would like to reference the photo here from a local mountain bike race that we held this weekend on Cobble Hill on Vancouver Island. I have been involved with this group of cyclists for as many years as I have been on this glorious rock/island. They have encouraged me up the mountains and laughed when I ride off into the bushes and fall over from my own uncontrollable laughter. They have also straightened my handle bars and checked for broken bones when I have really crashed hard and stayed down for a while! I am honoured to create the four, first prize beer steins for this race, which I volounteer and really enjoy making. 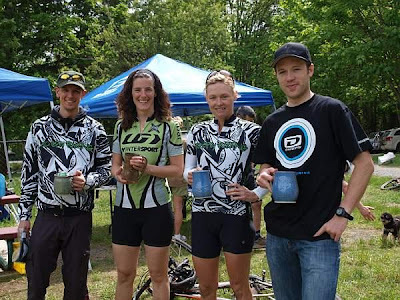 I also have had a few really cute comments about trying to win a stein during the rest of the year when I have met up with people who were at the race and will be returning. The reactions that I got from both the race organizers and the racers was uplifting and humbling, I can't wait to make some more work for the next race we hold. Donating pottery, in this case, warms my heart and makes me smile in the studio on a sunny afternoon, as I am trying to use a syringe full of runny slip clay to turn a line and blob of clay into a bicycle shape that will still look like a bike after it is covered in glaze and fired twice. Now that is a donation! It starts in my soul and I actually laughed out loud (yes, as always, I was alone in the studio at the time) making the steins and remembering the precious afternoons I have spent on the mountains: riding, watching Dave race, cleaning up after the races and leaning on the car after a good ride hashing over how I finally rode that bridge or log that I have been scared of for--ever! This year's Cobble Hill Cross Country Mountain Bike Race drew out an elite crowd, some pictured above, the likes of Melanie McQuaid and Drew McKenzie and other famous racers including Wendy Simms and Norm Thibault who showed the adoring crowd what real mountain cyclists look like in action, not the bumping into logs and bouncing back and "oooofffffff" noises that we normally see (looking down, that is, hahahahahhaa). The little bike club that I happily support is not only a non profit but allowed Dave and I to take the cheque for their donation to the food bank here in Duncan, and give it to the manager there and get a little sunshine in return from her, she must be 80 years old (oh to be so involved when I'm 80!! ).